High school students from radically different backgrounds work together to build a storyline before filming. After earning an MA in Art + Design Education from RISD in June, Tom Flint MA 18 quickly found an opportunity to test his theories about teaching cross-cultural filmmaking in the real world. 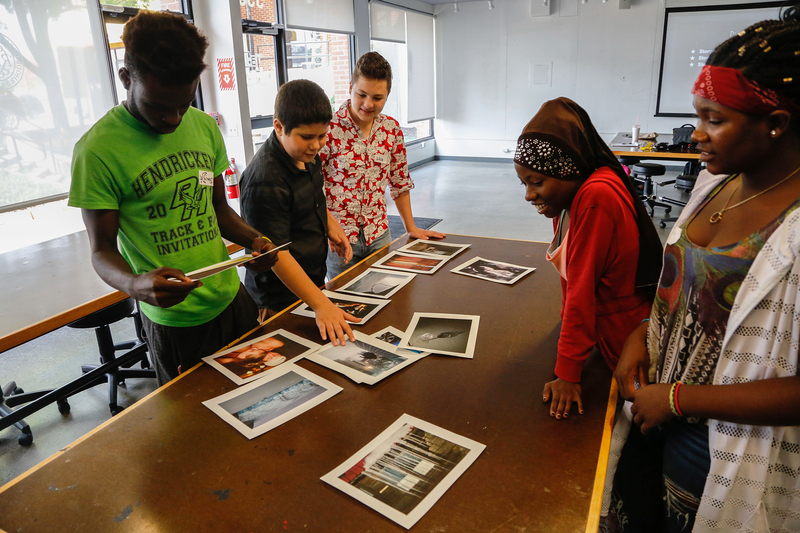 He worked with other arts educators to crowd-fund and pilot two summer filmmaking workshops: one in the Boston area that brought together American and Japanese teenagers and one at RISD in which American-born high school students teamed up with teenagers from abroad involved in the nonprofit Refugee Dream Center in Providence. 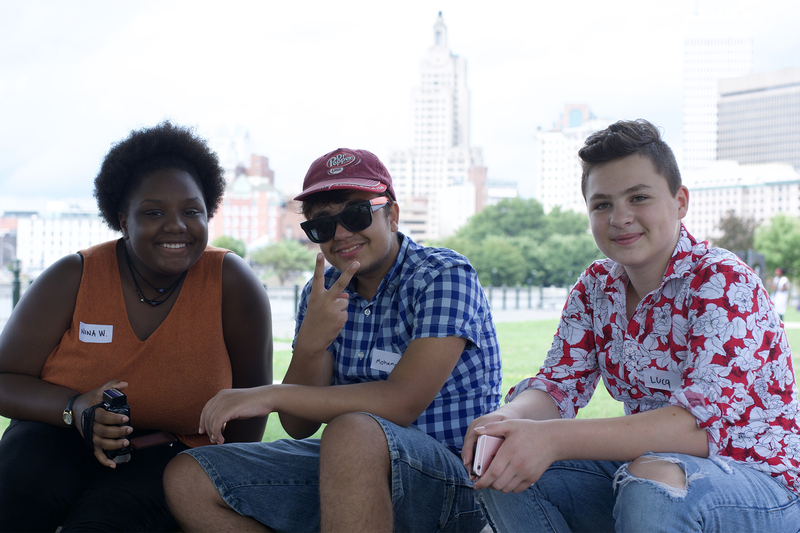 Educator Tom Flint MA 18 leads a collaborative three-day filmmaking workshop on College Hill in Providence. “Filmmaking is a collaborative form of art, and any experienced filmmaker knows that the joy and thrill of working on a project arises from the diverse mixture of ideas coming from the different artists involved,” Flint notes. Participants skipped over the script-writing phase and dove right into shooting and building a story line that evolved in the moment, right up until the final stages of editing. Workshop participants break through cultural and language barriers. The rules were simple. Each film needed to have a beginning, a middle and an end and to incorporate some kind of twist in its narrative. The story had to contain at least one identity-oriented memory from each member of the team, and the dialogue needed to tap each team member’s native language. Participants shot, edited and presented their films over the three-day period, showing final cuts that averaged about five minutes in length. “It was extraordinary to watch students from different cultural backgrounds exchange ideas and become more curious about other ways of viewing the world,” says Flint. As he expected, filmmaking proved to be much more than a medium for realizing any one creative vision. Instead, he explains, it’s a tool for learning about the world, developing a mindful approach to making, and communicating beyond cultural and language barriers. 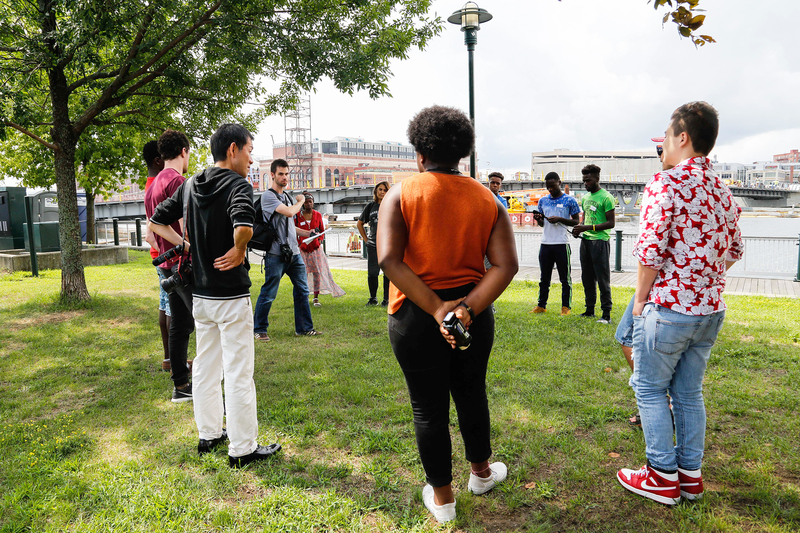 Flint is building on the experience to develop Zoom-Out (named after his thesis at RISD), an after-school filmmaking program for students in diverse communities in Rhode Island and Massachusetts and eventually abroad. Thanks to footage captured by Film/Animation/Video student Leilei Xia 20 FAV, he’s also working on a documentary about the workshops that he plans to screen along with the student shorts at the Refugee Dream Center later this year. Each film needed to incorporate some kind of narrative twist. Film/Animation/Video major Tara Gupta 19 FAV creates an inspiring YouTube series called 100 Days to 0 Waste. At a screening of his film Two Trains Runnin’, director Sam Pollard encouraged students to embrace the challenge of turning history into socially conscious documentaries.